A surf ski paddler has told of his “absolute shock” this morning when he was tipped out of his craft by a three-metre shark at Mullaloo beach, in Perth’s north. This news I caught right in a cafe in the Perth Airport as I waited for my ride into town, Martin Kane, who is in his 50s, was paddling with a group of friends about 150 metres off shore when the shark launched at his surf ski about 7.15 am. Mr Kane, who ended up at the shark’s mercy in the water for several moments after the incident, was in good humour this afternoon as he showed his ruined $3500 craft to the media. “I didn’t expect to see all of you today,” he laughed. But he wasn’t nearly as calm and composed this morning. “I’ve heard and seen car crashes and it was just like that – a really loud bang,” Mr Kane said. “It was pristine conditions with light rain. Suddenly there was this explosion and I just couldn’t understand what had happened. Mr Kane paid tribute to his paddling friend Dale, who put his own safety at risk by rushing in to help him to shore. Mr Kane said much of his confusion stemmed from a belief that the shark had come from the direction of the shore, rather than deeper water. “It was almost like the shark came out from the beach towards me,” Mr Kane said. Mr Kane did not want to buy into questions about whether the shark should be targeted for culling, saying “no, no, no…that’s for me to say”. 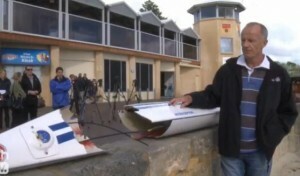 Surf Lifesaving WA’s Paul Andrew told the ABC it was a forceful attack. “The paddler leading the group was… hit with great force sending him flying into the air,” he said. Mr Andrews said the rescue was an extremely brave act. “The guy that actually picked the person [being attacked] out of the water paddled past the shark to go and pick his mate up,” he said. It was not clear what type of shark was involved. The beach has been closed until at least Friday morning. Mr Kane’s near-miss this morning came after a horror run of fatal shark attacks in WA in the past 12 months. Bodyboarder Kyle Burden was killed at Bunker Bay in WA’s South West in September, before businessman Bryn Martin disappeared while swimming off Cottesloe beach in October. US diver George Wainwright was killed at Rottest in October and Busselton father Peter Kurmann was taken at Port Geographe Marina in late March. Source: WAtoday.com. Photo Credit: Perth Now.